…the art of maintaining equipment to achieve the optimal service life, efficiency and performance, and to prevent breakdowns. What is required simply, is to get all mechanical components internally clean (externally helps also), keep them clean, and feed them with clean oil, clean fuel and clean air as necessary. Then go for the best lubrication you can afford, it’ll be money well spent. You need to check thoroughly all major components for signs of deterioration, so that corrective action can be taken to avoid any component failure. Checking includes visual inspection, listening for strange noises developing, hot/burnt or oily type smells, increased operating temperature of engines, transmissions, wheel bearings, etc. 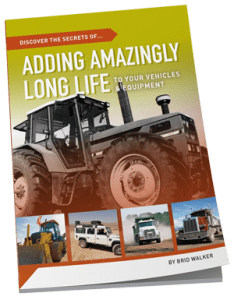 Wash your vehicle regularly, and this is one of the best opportunities to look for early signs of problems…take a look at Chapters 1 & 2 of our book, Discover the Secrets of Adding Amazingly Long Life to YOUR Vehicles and Equipment, for more hints. But then there are certain parts, like internals of engines, fuel systems, turbochargers that require chemical assistance to clean…that is, unless you look forward to the time and expense of completely overhauling engines, fuel pumps, turbos and the like. In the table below are a few of our products that will really make life easy for you, do a thorough job of restoring pristine cleanliness, and save you a packet of money in the process. Immediately below is the OIL SPOT TEST. It gives you a very good idea of how good your level of engine maintenance is. Simply place a drop of engine oil on some blotting paper, and come back to it again after it has had some time to migrate properly through the paper. This may take a few hours, but works quickest when the oil comes straight from a fully warmed up engine. The lower two on the right hand side are causing problems. The oil is totally saturated with soot, and damaging your engine from the abrasive load, as well as having no detergent left to keep the engine clean. These engines need the Flushing Oil Concentrate to bring them back to clean condition, and either FTC Decarbonizer or Cleanpower fuel system detergent to clean up combustion & fuel systems (respectively). 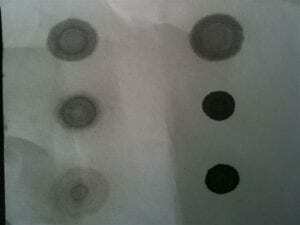 The other 4 oil spots are from engines kept clean by the use of FTC Decarbonizer & Cleanpower. 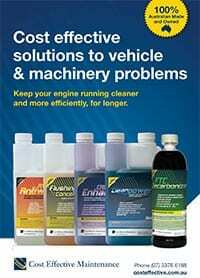 This removes all crankcase deposits, including sludge and piston ring deposits. This permits optimized oil flow and unimpeded lubrication to all parts, ensuring good cooling. Stressful drag, due to deposits is eliminated, so engines sound quieter, and operate smoothly. Call it a Super Lubricant if you like, AW10 provides massive reductions in internal friction consequent heat. It enables the oil to carry much higher loadings without rupturing the lubricating film. Everything rolls a lot smoother and quieter. Wear will be retarded by this action. Add Cleanpower directly to the fuel to improve fuel system efficiency, and reduce deposit related stresses. For common rail diesels (2007 and later), the CRD Fuel Enhancer provides the same level of cleaning ability, but with enhanced lubrication for th ediesel fuel and anti-rust protection. Continue treating the fuel with FTC to progressively remove stressful deposits of carbon from combustion and exhaust spaces, including turbochargers, and exhaust systems. Allows your engine to breathe at its most efficient. Caterpillar Main Engines (cargo ship). At 19,000 hrs, the owners wished to postpone rebuilding the engines by 3 months. FTC Decarbonizer was supplied (along with our Flushing Oil Concentrate and AW10 Antiwear) to decarbonize and destress the engines. From that point until a total of 25,000 hrs, the engines performed much better, with less oil consumption, less smoke and smoother running. They were only then changed out at the insurer’s request.